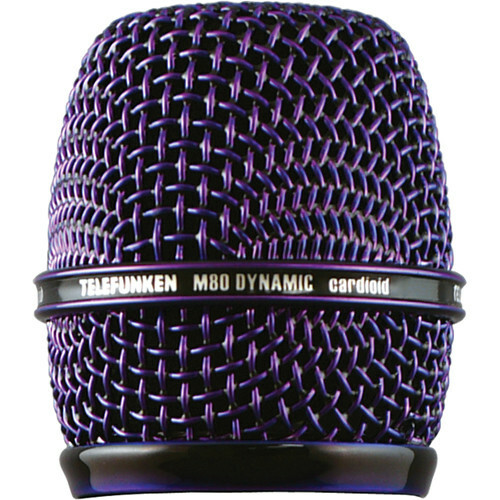 This purple Telefunken M80 Dynamic Microphone Replacement Grill is available in case your original M80 microphone grill is lost or broken. It is comprised of a ball-shaped woven metal mesh that lessens breath sounds, plosives, and wind noise. The microphone grill screws into the M80 dynamic microphone body. Box Dimensions (LxWxH) 3.3 x 2.8 x 2.7"
Replacement Grill for the Telefunken M80 Dynamic Microphone (Purple) is rated 4.8 out of 5 by 4. Rated 4 out of 5 by Krittidej from M80 grill Superb product. But,This item come with M81 sticker and i want M80 black/nickle. So it's not look like the advertise. Rated 5 out of 5 by XT Dream from Telefunken Takes a while to receive because this is a special order item, but it is a beautiful peice and was worth the wait! Rated 5 out of 5 by Nathaniel from Fits and looks great Fits perfectly. Looks great. Brand new. OEM part. will this fit a sennheiser e935? No - it is designed for use with a Telefunken M80 only. What is the inside diameter of this grill? Thanks! Does it work for the wireless capsule as well?